An endodontist is a dentist with 2 or more years of additional training after dental school, who has received certification from an accredited advanced education program, and who limits their practice to endodontics. Endodontics is a branch of dentistry recognized by the Canadian Dental Association which deals with treatment of the pulp and surrounding tissues of a tooth. The portion of your tooth that you can see when you look in the mirror is the called the crown of the tooth. 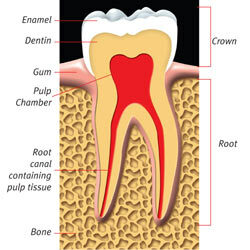 The rest of the tooth is hidden beneath the gum line and is called the root. The pulp chamber and root canals are hollow spaces inside a tooth. These spaces contain the pulp – a soft tissue consisting of blood vessels and nerves. 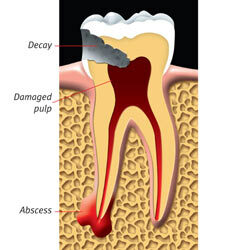 The pulp may become inflamed or infected as the result of a cavity, a tooth fracture, a traumatic injury or gum disease. When these kinds of problems occur, endodontists are enlisted to treat the root canal and save the tooth. Most often, the only alternative to root canal treatment is to extract the tooth. After successful root canal treatment, your general dentist will restore the tooth. After a diagnostic examination and in consultation with your general dentist, an endodontist will determine is your tooth is a candidate for endodontic treatment. If your tooth is suitable, the next step will be to remove the inflamed or infected pulp and seal the root canal system. This normally involves local anesthesia (freezing). Treatment may be completed in one or more visits depending on the condition of the tooth. In most cases, after endodontic treatment, you will be able to return to your normal routine. Sometimes endodontic microsurgery is needed when a regular root canal treatment cannot be done or when an infection has not healed after regular endodontic treatment.